I like to work on the lentils first, then roast the cauliflower and tomatoes while the lentils simmer. While the lentils and cauliflower cook, I make any toppings I’m using. Pickled red onions, tahini sauce, and the gremolata in this case, but fresh herbs, lemon wedges, other cheeses, olives, or anything else you can imagine would be wonderful. For the lentils, dice some onion and mince some garlic. Saute the onion and garlic in a small pan with a lid with some olive oil over medium heat for about three minutes, then add the lentils and veggie stock to the pot. Cover the lid and simmer the lentils for 30-40 minutes (or whatever the package says) just until they’re tender but not mushy. Check them at the lowest time your package suggests. If there is some liquid left in the pot, let the lentils finish simmering uncovered to evaporate a bit of the stock. 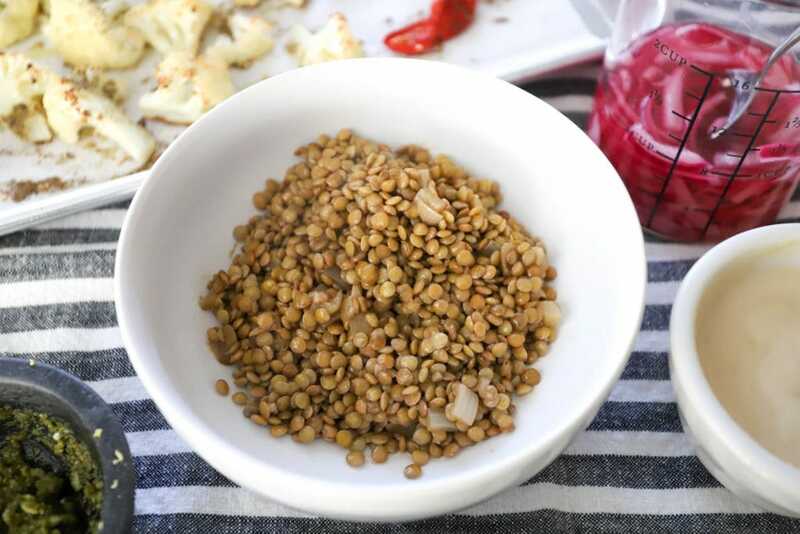 Add a few pinches of salt each time you check the lentils until they are very flavorful. Meanwhile, roast the cauliflower and tomatoes. I do this on two separate pans when I make a lot, but the cook temperature and time are the same! 425F for 25 minutes. 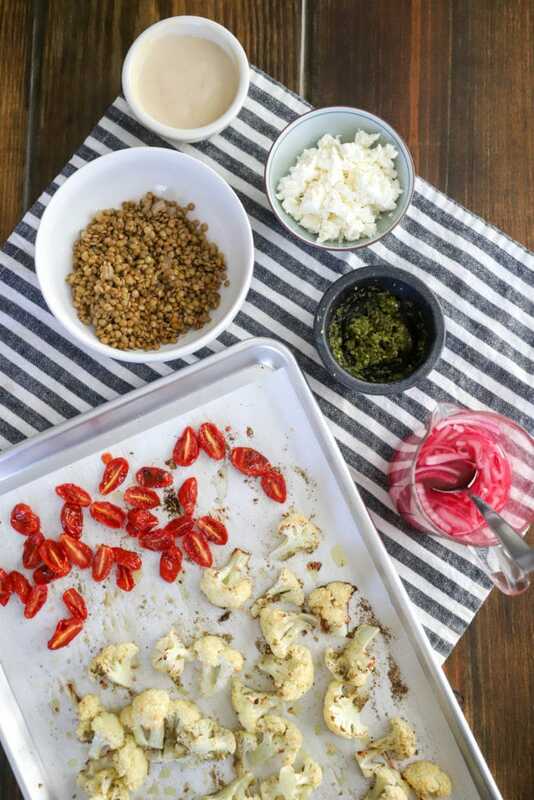 I drizzle the cauliflower and tomatoes with oil and sprinkle them with salt, then sprinkle zaatar all over the cauliflower. When they’re roasty and tender, they’re done! Now, while those two big things are working, make anything you’d like to put on top of the bowls. Again, I went all out with toppings, but you can grab just a few things to prep or chop and the bowls will be just as delicious. 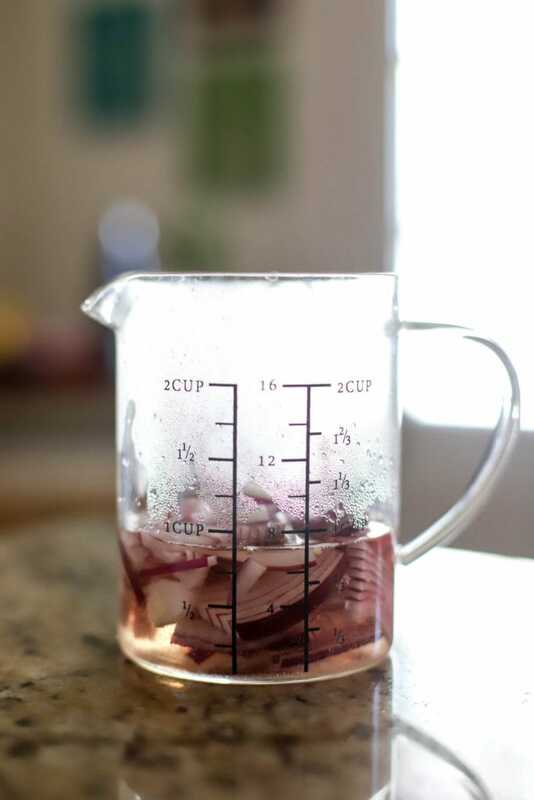 I love pickled red onions: microwave some water, vinegar, salt, and sugar together, then drop some sliced red onion in the mixture. Let it sit for 15 minutes or so. These keep wonderfully in the fridge. 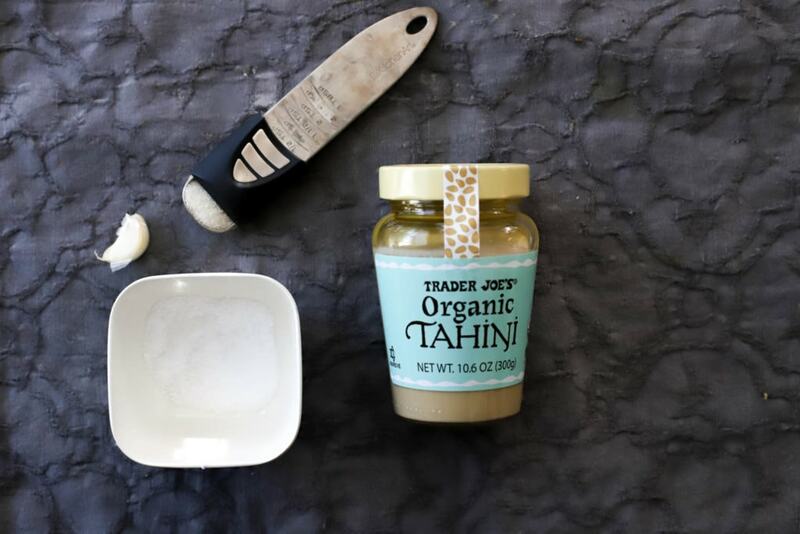 The tahini sauce is made with plain tahini, water, salt, sugar, and minced garlic. EASY. Whisk it together, adjust the flavors, and add more water if you need to thin it out at all. I sometimes make tahini sauce with lemon juice, so if you like more tang on top of your bowls definitely go that route. I wanted something green on the bowls, and gremolata is usually finely chopped herbs, garlic, citrus zest, salt, and sometimes some nuts. Here I just used pesto, lemon zest, and extra garlic and the result was SO good. This could definitely be skipped for a sliced green onion or some fresh herbs, but I was feeling extra because I made these on a Sunday and it was sunny and both kids were happy at the same time. So now! The lentils are tender but not mushy. Add MORE salt if you aren’t sure. These should be good enough that you’d eat them on their own. Then we have everything else for our bowls. 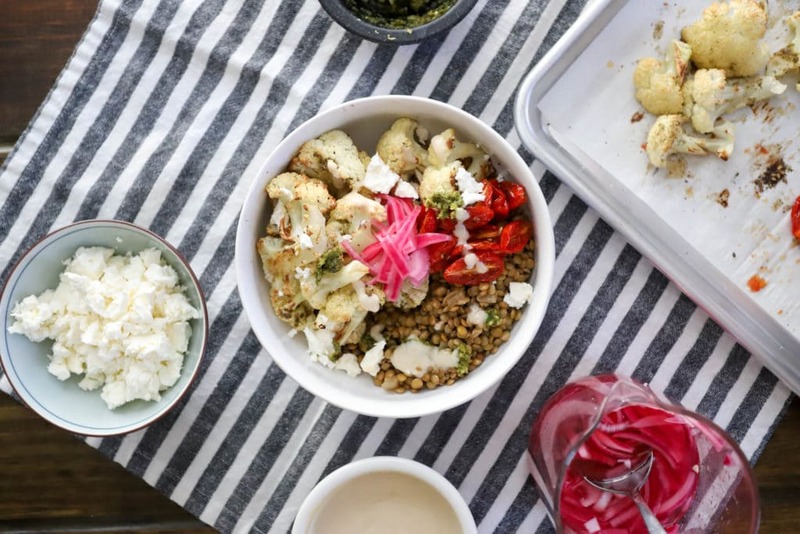 Roasted cauliflower and tomatoes, pickled red onions, pesto gremolata, crumbled feta cheese, and tahini sauce. 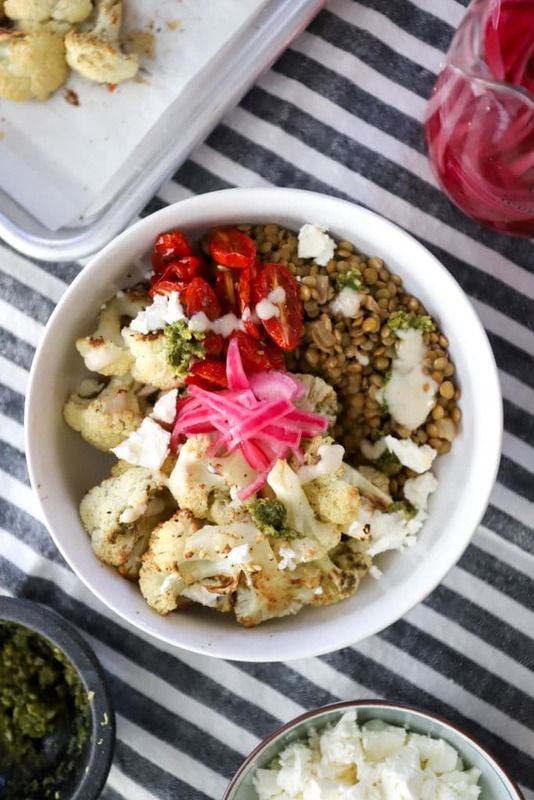 Build bowls however you like, go excessive on the toppings, and lunch or dinner is READY. I love these for a thousand reasons, but a big one here is that the components are great as leftovers. 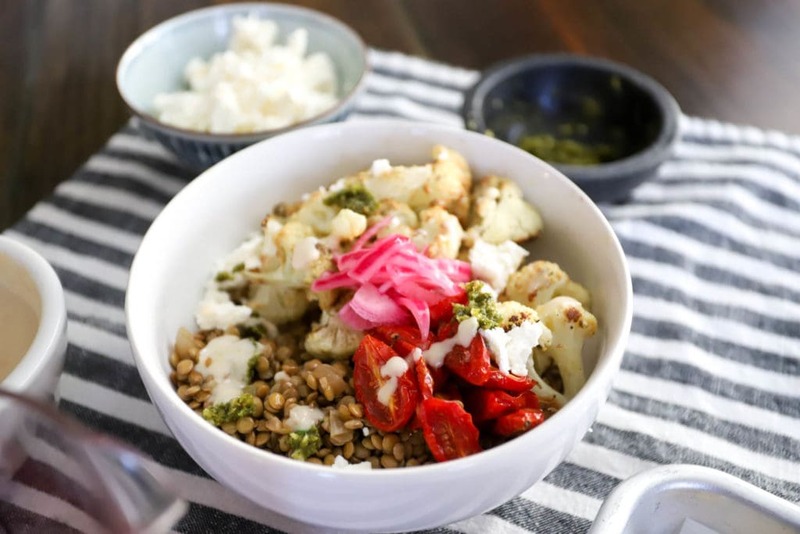 If there was one thing that wasn’t perfect I’d say it was the cauliflower, but you could make EVERYTHING except for the cauliflower and tomatoes on the weekend, then roast veggies and have this great dinner on a weeknight. I did eat the cauliflower leftover, though, and it was still delicious. The deep flavors of zaatar are so good with the tahini and tangy tomatoes. 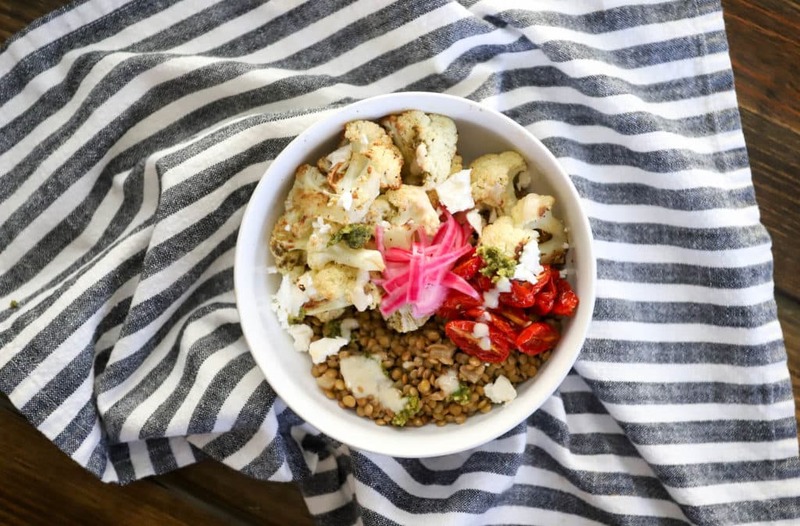 PS zaatar is a middle eastern spice blend that we use all the time on roasted veggies and chicken, but if you don’t have any just…skip it. Seriously, there is plenty of flavor without going out of your way for something you don’t use a ton. OR OR OR buy some and use it all the time. Your call. 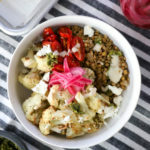 The recipe below looks a little high maintenance, but trust me when I say that all of the components are super easy and the bowls are delicious with just one or two toppings. I wanted you to have options in your new year, though, so you’re welcome for that. Make these soon! Maybe for lunch or dinner on Sunday then for lunches all week. 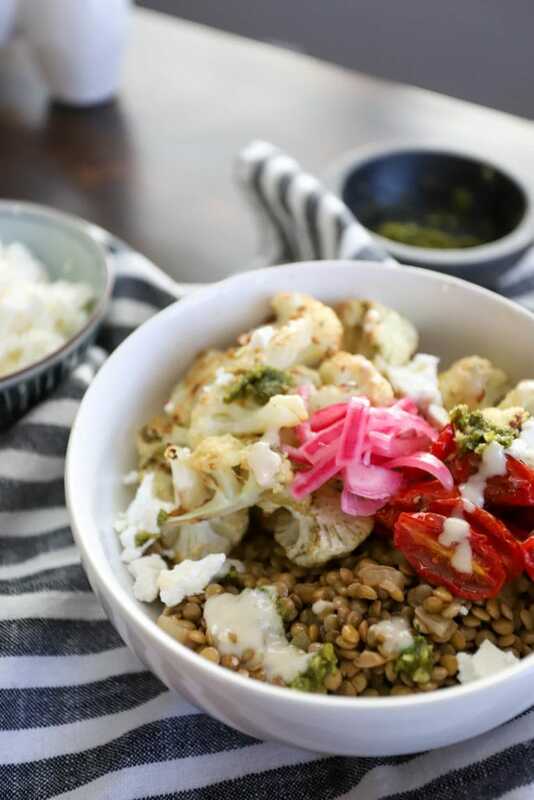 Wonderfully flavorful lentils topped with roasted veggies and bright toppings. Full of health without being obvious about it. Cook the lentils. In a small sauce pan with a lid, saute the onion and garlic over medium heat for a few minutes until soft. Add the lentils and stock and cover the pot. Simmer the lentils for 30-40 minutes until tender but not mushy. 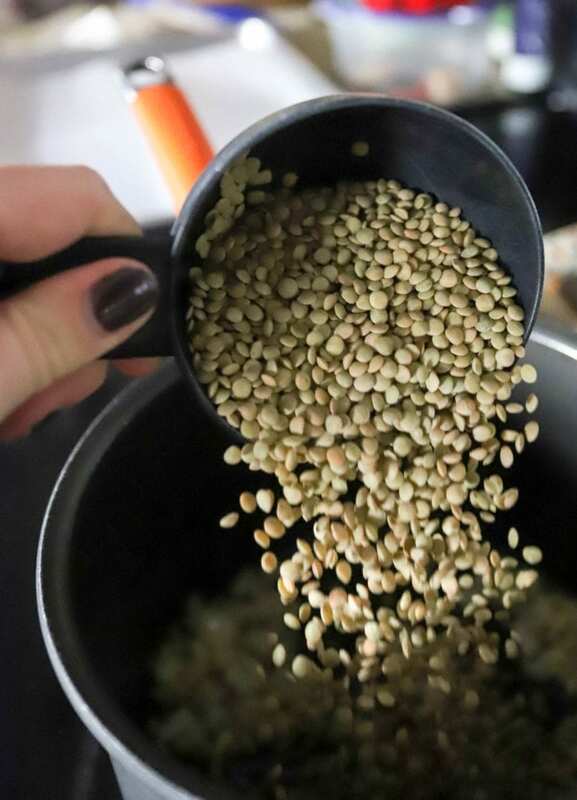 Each time you check the lentils, add a few pinches of salt until the lentils are very flavorful - you should want to eat them plain! Meanwhile, roast the veggies. 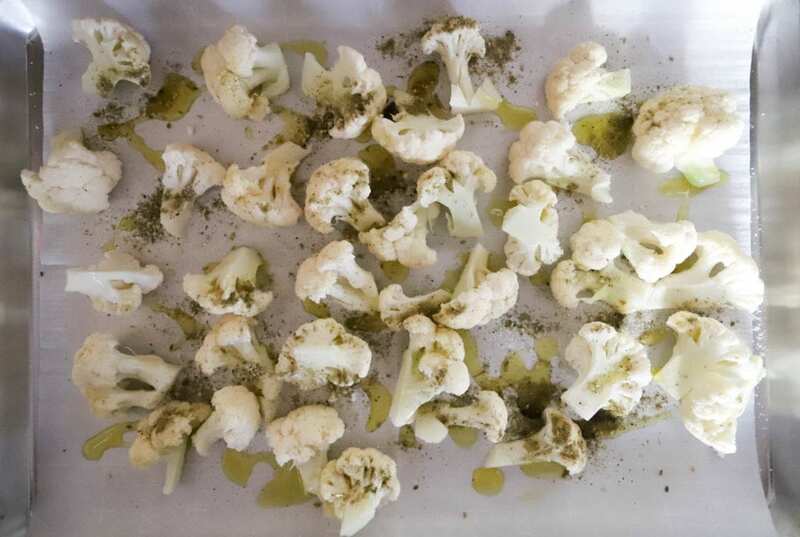 Preheat the oven to 425F and arrange the cauliflower and tomatoes on baking sheets, either two smaller sheets or one large baking sheet with the tomatoes on one side and cauliflower on another. Drizzle all of the veggies with olive oil and sprinkle them with salt. 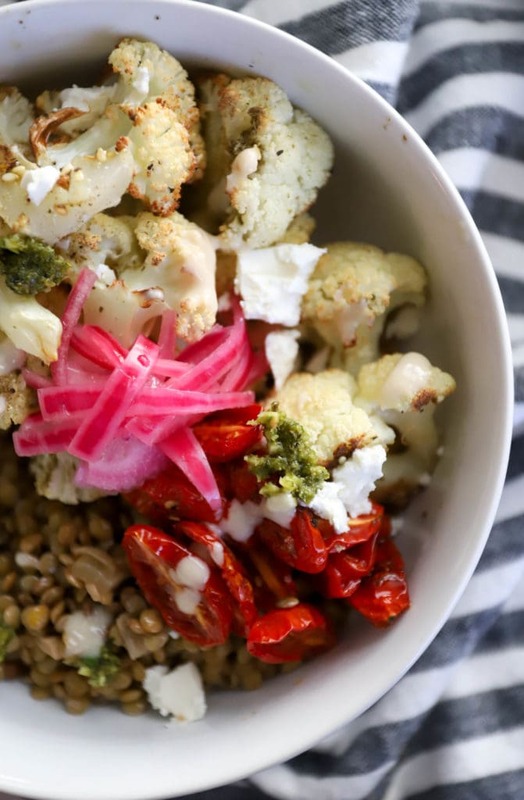 Sprinkle the zaatar seasoning all over the cauliflower. 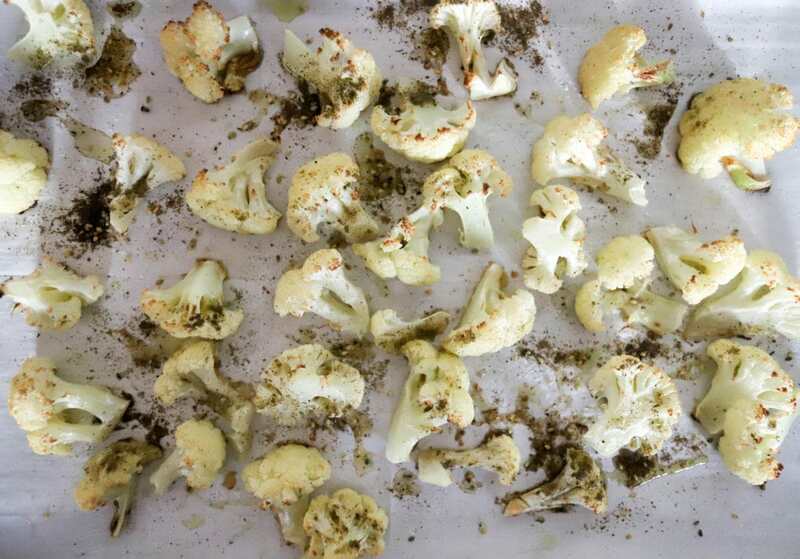 Roast the veggies for 25 minutes until the cauliflower is brown and tender. Make the pickled onions. Combine the water, vinegar, salt, and sugar in a microwaveable bowl. Heat for two minutes until hot and stir to dissolve the salt and sugar. Add the sliced onions to the hot vinegar mixture and let sit for at least 15 minutes. These can be made ahead and keep in the fridge for a few weeks. Make the tahini sauce. Combine all ingredients with a fork or small whisk, whisking until smooth. Taste and adjust the seasonings to your preference. Add a squirt of lemon juice here if you like extra tang. Make the gremolata. 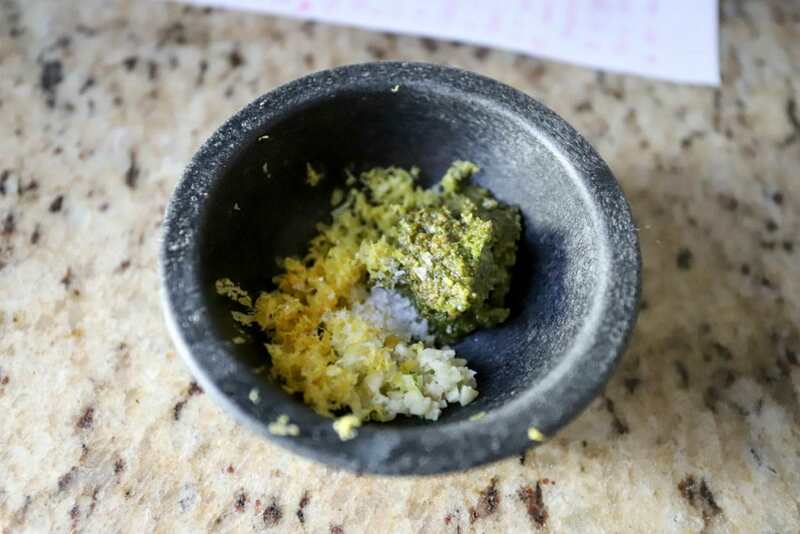 Use a fork to gently combine the pesto, salt, garlic, and lemon zest until slightly crumbly. 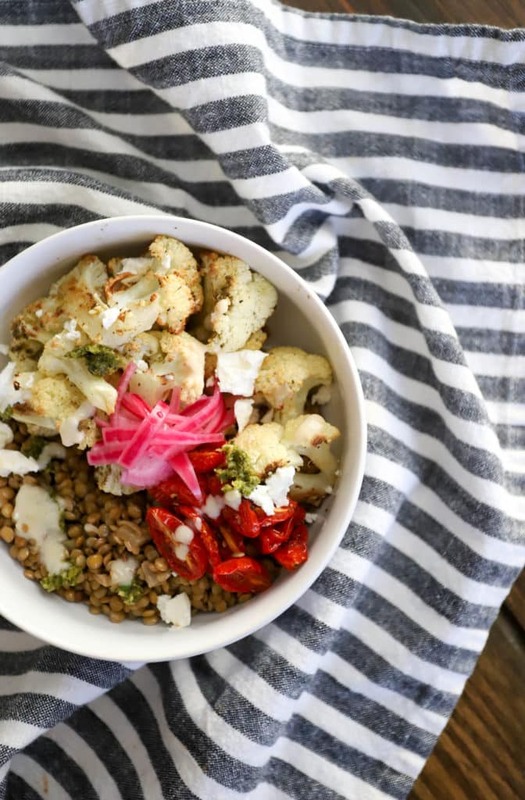 Make the bowls with a bed of lentils, some of the roasted veggies, and any of the toppings you'd like. Drizzle with the tahini sauce and DIG IN. Enjoy! 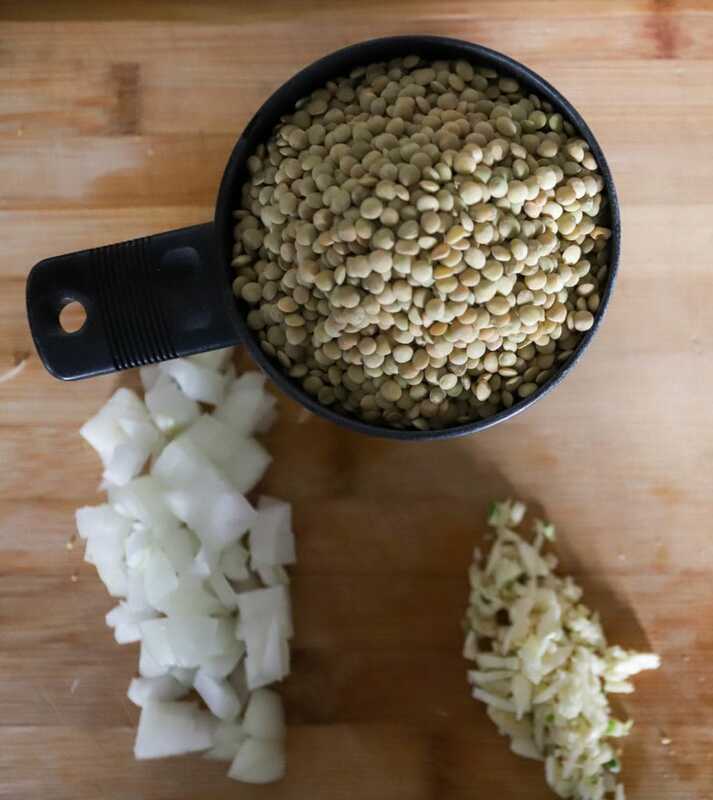 Lentils: use the package directions for quantity of stock and time to simmer, and use chicken or another kind of stock if you prefer! I make veggie stock from the Better than Bouillon salt lick jars and it is SO good and maybe full of chemicals, don't tell me.